As a University Technical College with a specialism in multimedia, Performance and the technical production Arts, we are delighted to report that our professional and specialist qualification results were once again superb and even better than last year. A Level results are also up on last year. GCSE results are solid two years in a row with English and Maths performing well alongside our specialist curriculum. GCSE technical subjects have seen 37% of students achieving a Distinction* - Distinction (A*-A); 73% achieving Merit and above (A*-B); and 87% achieving pass and above (A*-C). Across the country, GCSE results have fallen when compared to last year. It is of course hard to compare as the exams this year are new specifications with a new grading system and they have been widely reported to be more challenging, While our results are slightly lower than last year (5% down in English and Maths), they continue to be much be improved than 2 years ago (up 16%). Therefore, given the extensive reforms to GCSE qualifications and the subsequent pressures faced by our students, we are extremely proud of their efforts and resilience as the first to sit these more difficult examinations in English and Maths. Elstree UTC sees outstanding results in professional and technical qualifications! 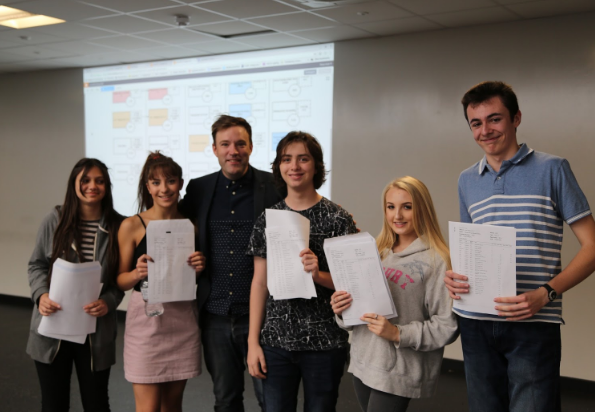 Staff and students at Elstree UTC are celebrating another successful year for Level 3 results both in our technical specialist subjects and at A Level. As a University Technical College with a specialism in multimedia, Performance and the technical production Arts, we are delighted to report that our professional and specialist qualification results were once again superb and even better than last year. 51% of students taking technical and applied qualifications achieved a Distinction star (equivalent to A* at A Level), 66% achieved Distinction and above (equivalent to A* - A at A Level), and 100% of students achieved a Distinction star to pass.